Pakistan's Foreign Office said that North Korea's actions are in contravention to the UN Security Council resolutions and undermine peace and stability in the Korean Peninsula as well as North East Asia. 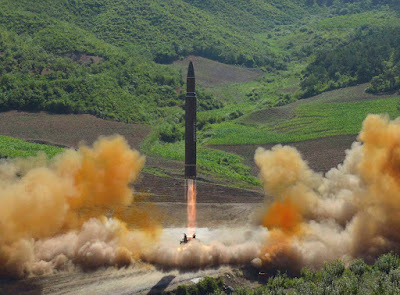 ISLAMABAD: Pakistan today expressed concern over the launch of an intercontinental ballistic missile by North Korea and asked Pyongyang to refrain from actions that could lead to escalation of tensions in the region and beyond. On Friday, North Korea fired a new intercontinental ballistic missile (ICBM) that experts say has the potential to reach the US mainland. "We continue to urge the Democratic People's Republic of Korea (North Korea) to comply with its obligations under the UN Security Council resolutions and to refrain from actions that could lead to escalation of tensions in the region and beyond," it said. "We call on all relevant parties to pursue the path of dialogue and diplomacy to reduce tensions and work towards achieving a comprehensive solution," it said. North Korea has fired 18 missiles during 12 tests since February, further perfecting its technology with each launch. On July 4, North Korea conducted its first test of an intercontinental ballistic missile (ICBM), which it claims could reach "anywhere in the world." The UN Security Council has already imposed six rounds of progressively tougher sanctions against North Korea.